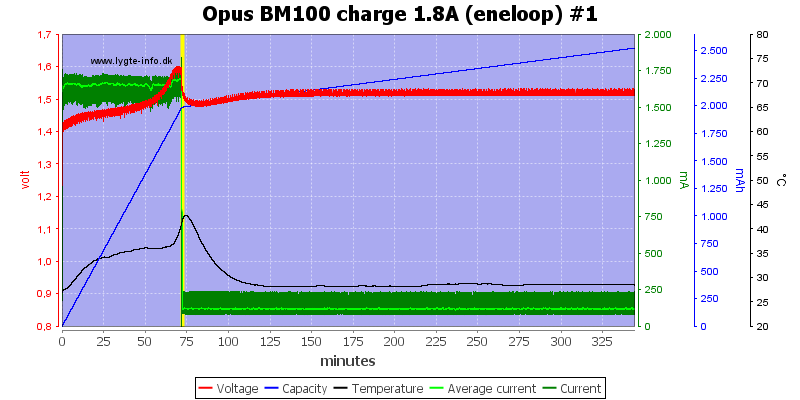 This Opus charger is one of the smaller analyzing chargers, but it does have a lot of functions. The charger comes in a cardboard box. The box looks the same on both sides and is missing the brand name. 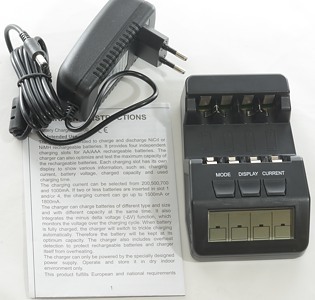 The contents of the box is the charger, a power supply and an instruction sheet. The power supply is universal voltage 100-240VAC 50/60Hz and with 3 volt output voltage. The voltage input is 3 volt, not the usual 12 volt, i.e. this charger only works with the supplied power supply. The user interface is 3 buttons and a display. DISCHARGE: Discharge, then charge the battery. DISCHARGE REFRESH: Charge/discharge a number of times. 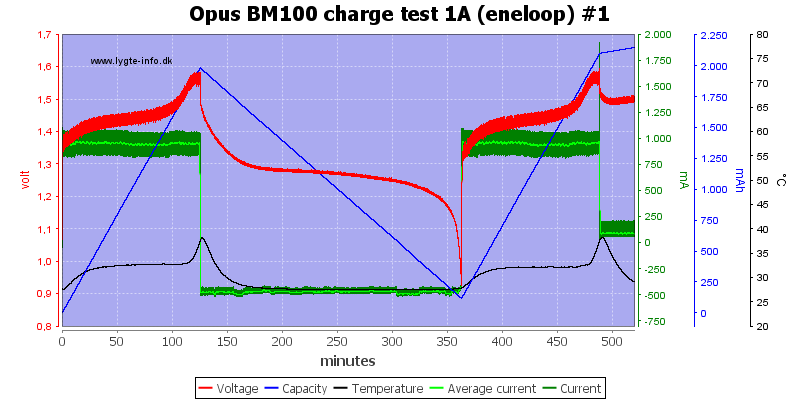 CHARGE TEST: Charge, discharge, charge, then shows the battery discharge capacity. 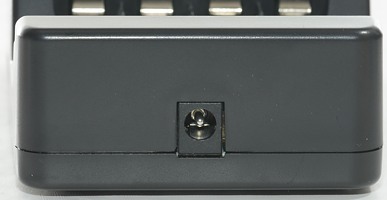 The CURRENT button will selected between possible currents. 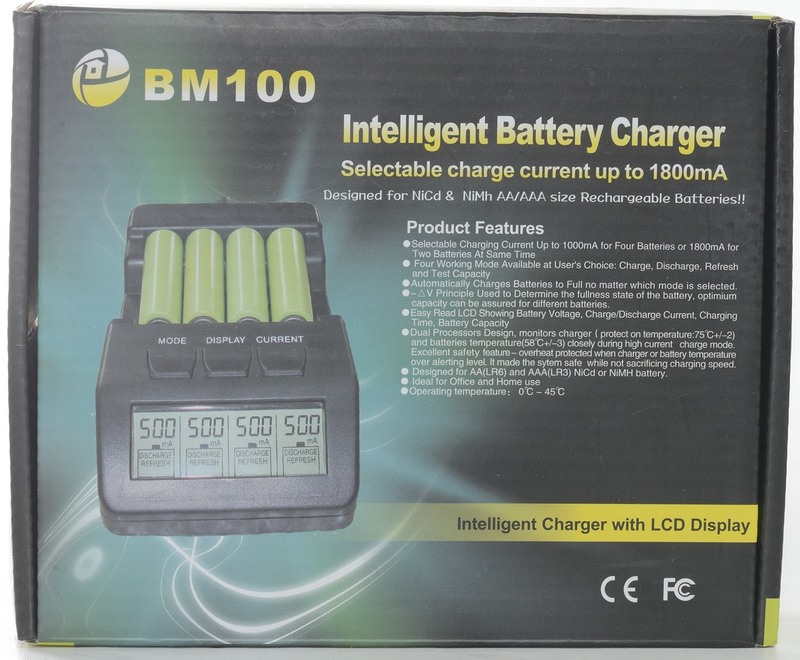 When charging the currents are 200, 500, 700, 1000mA and if only slot #1 and/or #4 is used, it is also possible to select 1500 and 1800mA. When discharging the currents are: 100, 250, 350 and 500mA. Display during startup, all text is visible. The display has no background light. Two slots busy with a refresh, but at different currents. Slot #3 is doing a test. 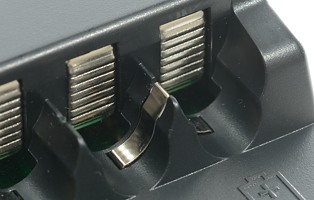 When using slot #1 or #4 at 1500mA or 1800mA the two center slots are turned off. MODE can always be used and will change mode for all slots. 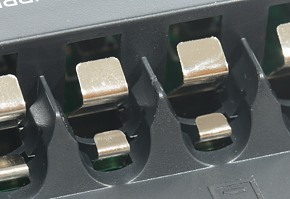 CURRENT can only be used when putting a battery into a slot and will change for all slots with a new battery. 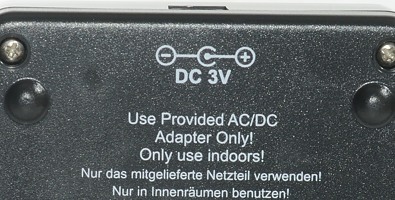 The charger uses the common slot type with two different levels for AA and AAA batteries. 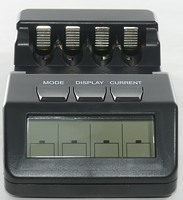 It has a shared temperature sensor between slot #1 and #2 and between slot #3 and #4. Here the two levels are easy to see. The charger can only handle up to 3500mAh, this is enough for AA cells, but prevents charging C and D cells with an adapter. The charger has no display background light. 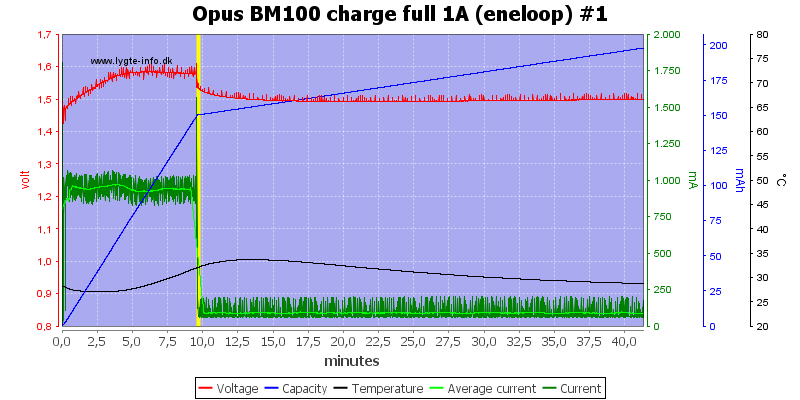 It will discharge batteries with about 0.015mA when not powered. 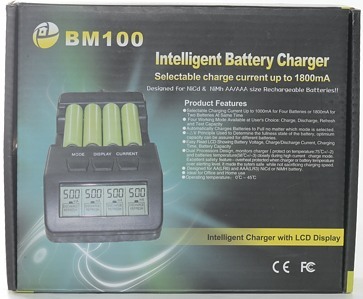 It will detect a battery when it has at least 0.5 volt, the meter does also work from 0.5 volt. 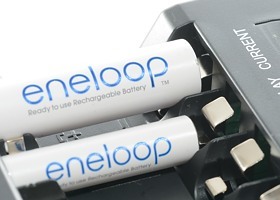 Any battery with 1.40 volt or more will be reported as full, but can still be charged. The voltage display is within 0.01 volt. It will always measure voltage with current off. 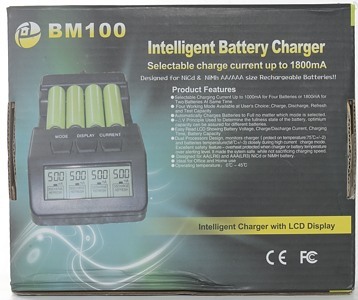 Default charge current is 0.2A (200mA) and charger will reset to that after a power loss or battery removal. When charging the current must be selected. The display will show the charged capacity when finished. This looks like a -dv/dt charge, where the battery is filled and then the charger switches to a trickle charge of about 90mA. 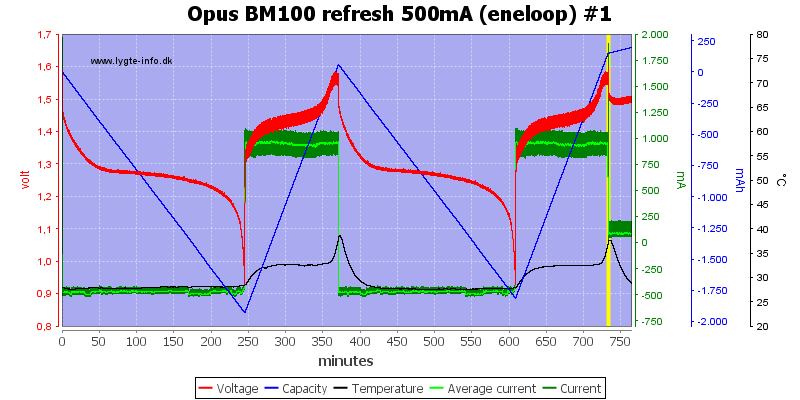 The display shows 2.06Ah in 2:04 hours. With a very low charge current it has problems detecting the -dv/dt. The termination is probably due to a timeout in the charger. 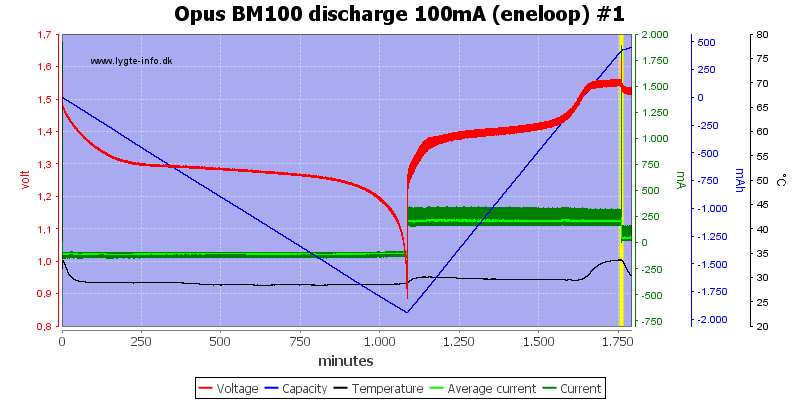 This is as expected and is also the reason not to use a low charge current with NiMH batteries, but always use the correct charge current. The display shows 2.5Ah in 13:00 hours. Another battery with higher capacity, the termination works perfectly. And a smaller battery with a suitable charger current, again it works perfectly. With full charge current, it is fast to charge the cell. Termination again works as expected. The trickle current is 120mA with this charge current. Charging on a already full cell needs about 10 minutes to terminate. With 4 cells at once, something happens. The charger gets hot and takes a rest a couple of times during the charge. The termination works as expected. 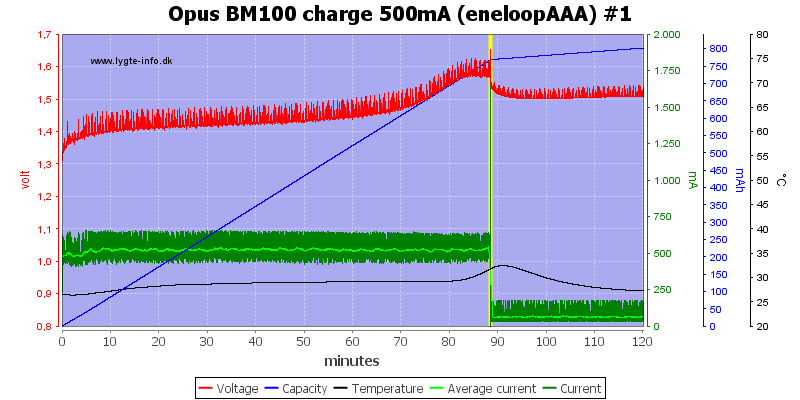 Reducing the charge current means less heat and the charger does not need a rest, but if I reduce the current too much I risk missing termination (500mA is at the low end for 2000mAh cells). 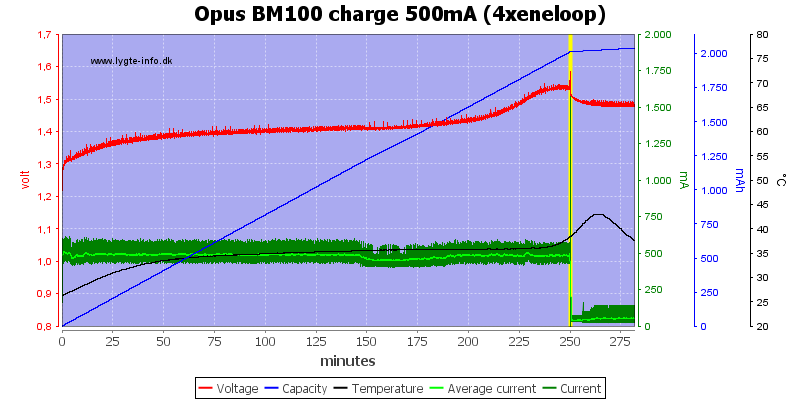 The charger gets warm when charging, but 50°C is within the acceptable limit for NiMH. The charger uses pulsing at a fairly high speed (50 Hz). When 1.8A charge current is selected, most of the time is with current on. 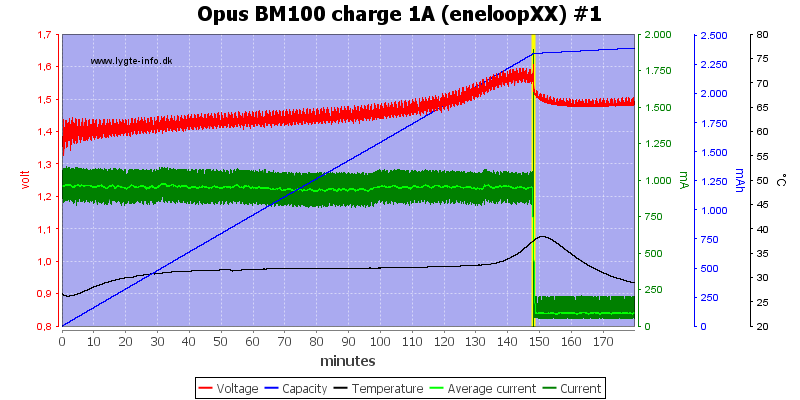 The charger does stop the pulsing shortly every second, probably to measure the battery voltage. Notice: Half the stops are with current on, the other half with current off. The charger is fairly fast at starting when no buttons are pressed, but it is at lowest charge current. The discharge will discharge the battery, the charge it again. For the discharge current must be selected between: 100, 250, 350 and 500mA, the charge current will be double of selected value. The charger discharges down to 0.9 volt, the does a charge. 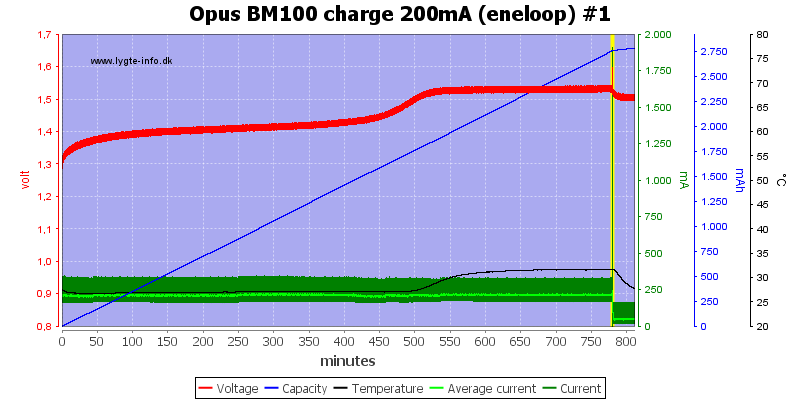 The display shows 2.03Ah charge in 3:57 hours. Using the lowest discharge setting takes a lot of time. On the following charge the termination fails (or is late). The display shows 2.16Ah charge in 11:15 hours, this is only for the charge. 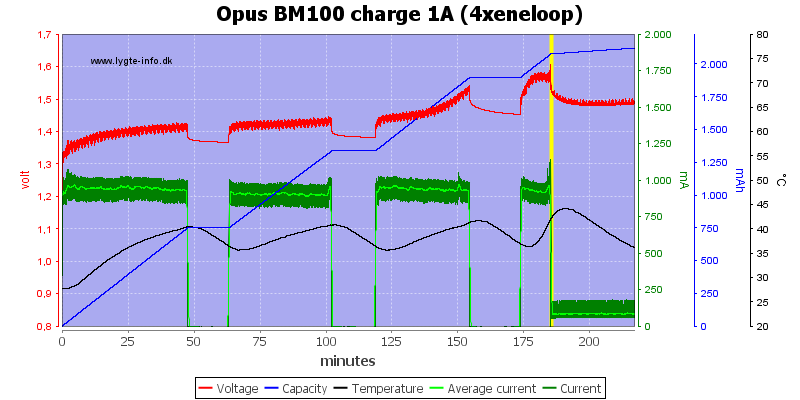 Even with four batteries there is not that much heat during discharge, but charge requires some cooling pauses. 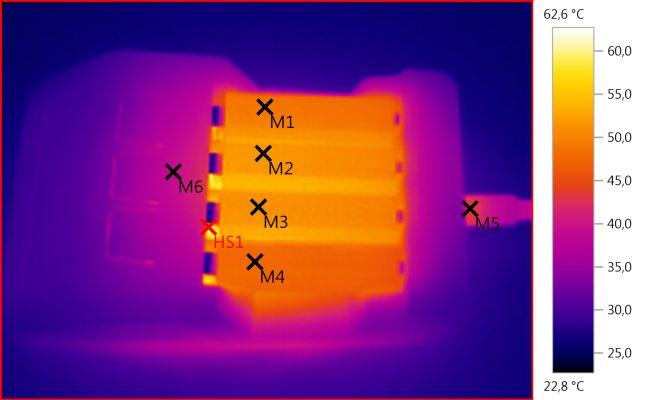 Discharging does not produce as much heat as charging. The discharge works the same way with pulsing. At 500mA, i.e. maximum discharge current, the current is drawn most of the time. Again there is pauses to measure voltage. Refresh will cycle the battery a number of times, how many is decided by the charger. 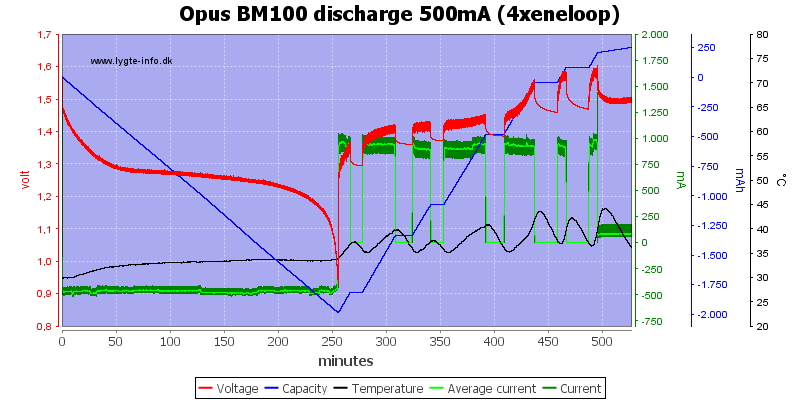 A discharge current must be select between: 100, 250, 350 and 500mA, the charge current will be double of selected value. Refresh always starts with a discharge. The display will show charged values. I started with a full battery and the charger did two cycles. The test function will charge the battery, then discharge it and finally charge it again. A charge current must be selected from: 200, 500, 700, 1000, the discharge current will be half the selected value. 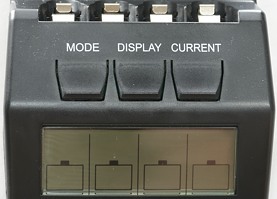 The 1500 and 1800mA current are not available in this mode. The display will show discharged values, i.e. this is the only function that shows the capacity of the battery. 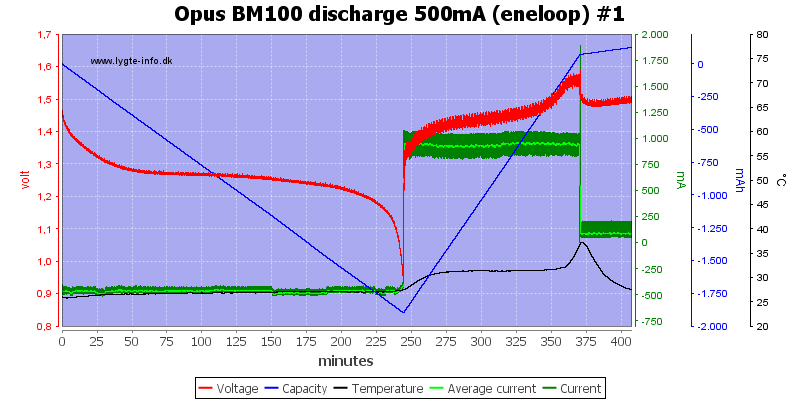 The charge, discharge and charge is easy to see on the chart. 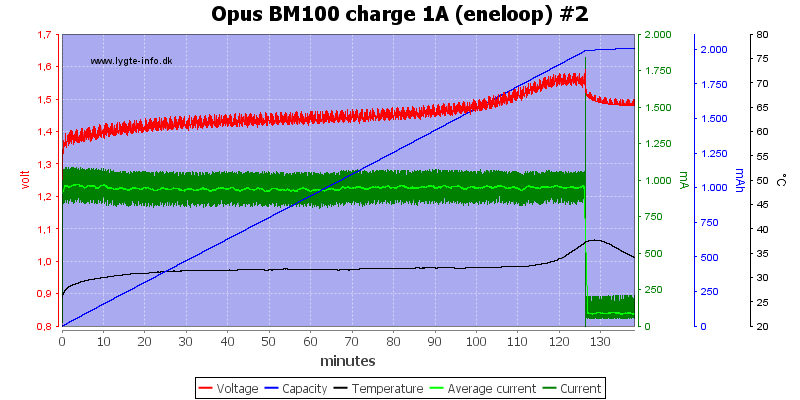 The display shows 2.03Ah discharge in 3:57 hours, this value is for the discharge. 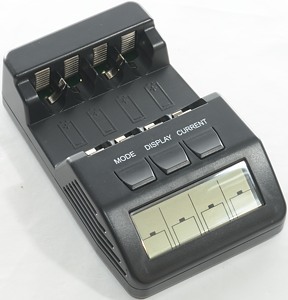 This is a fairly small model for an analyzing charger, but the functions are about the same as on other models. 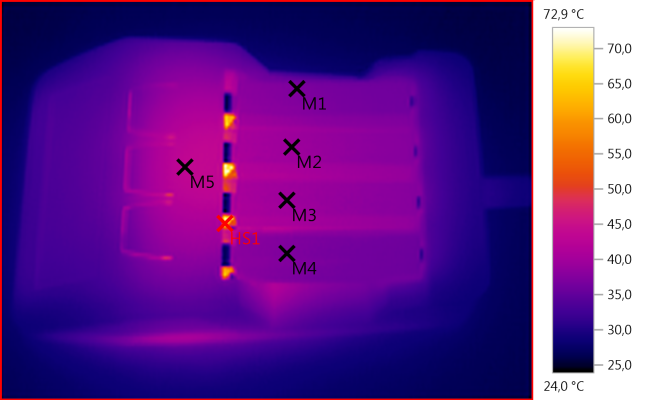 The problems with it, does also exists on other small (analyzing) chargers: Heat is difficult to handle in the small size, especially without a fan. Most modes show charged capacity, not discharged capacity. I like that is used -dv/dt charge termination, this fills the batteries, but it is important to select high enough charge current! I will call this an acceptable analyzing charger and for the price it is a good charger.